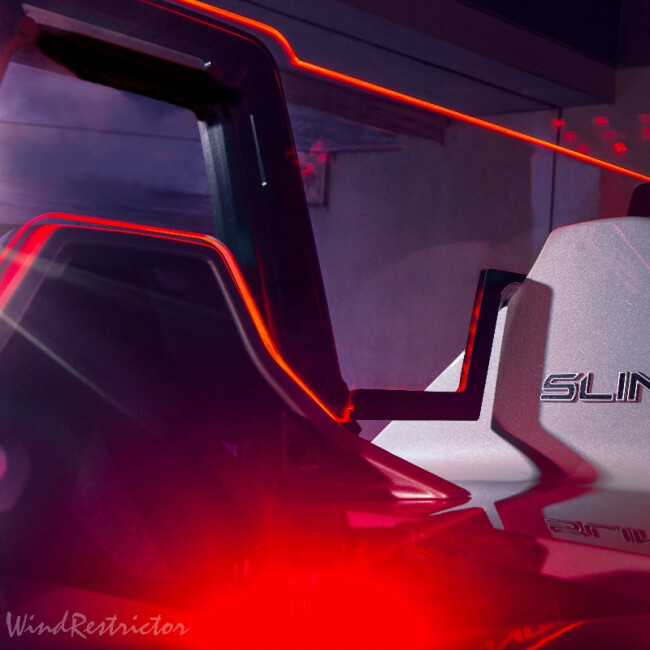 The WindRestrictor® brand wind deflector for the 2015, 2016, 2017, and 2018 POLARIS SLINGSHOT® is a “DIY” do it yourself installation and requires no advanced mechanical or electrical knowledge. It will fit the base model SL and SLR models. Please see the compatible accessories image under the main photo image of this listing. This shows the various tops that the Windrestrictor® will work with. 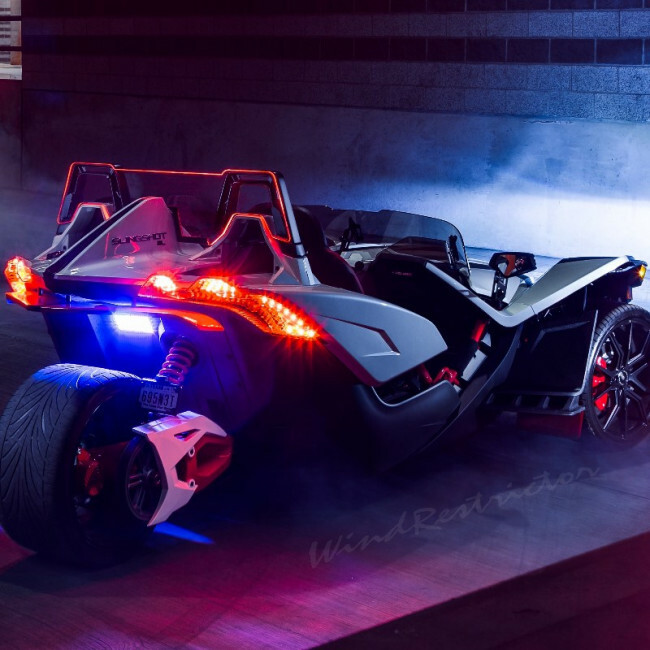 They have confirmed fitment with several of the roofs available on the market for Slingshot owners. If you have a roof that is not listed, please contact WindRestrictor® direct to place your order. This windscreen requires no drilling or permanent modification to your auto cycle. The product comes with printed instructions which are easy to understand and intended and has photos/illustrations for you to follow along with. A lifetime warranty is included with the purchase which guarantees that the product will never fade, yellow, peel, or crack like other sub-par designs on the market. What makes the WINDRESTRICTOR® brand superior to other brands available? According to windscreen reviews, customers prefer a sophisticated product that complements the sleek features and accessories of their vehicles. The WindRestrictor® brand is engineered to perfection by professionals. The deflector itself is over 30 times stronger than glass and crystal clear to ensure optimal rear visibility. The deflector's size and shape is designed to block the maximum amount of wind possible while remaining in place once installed. 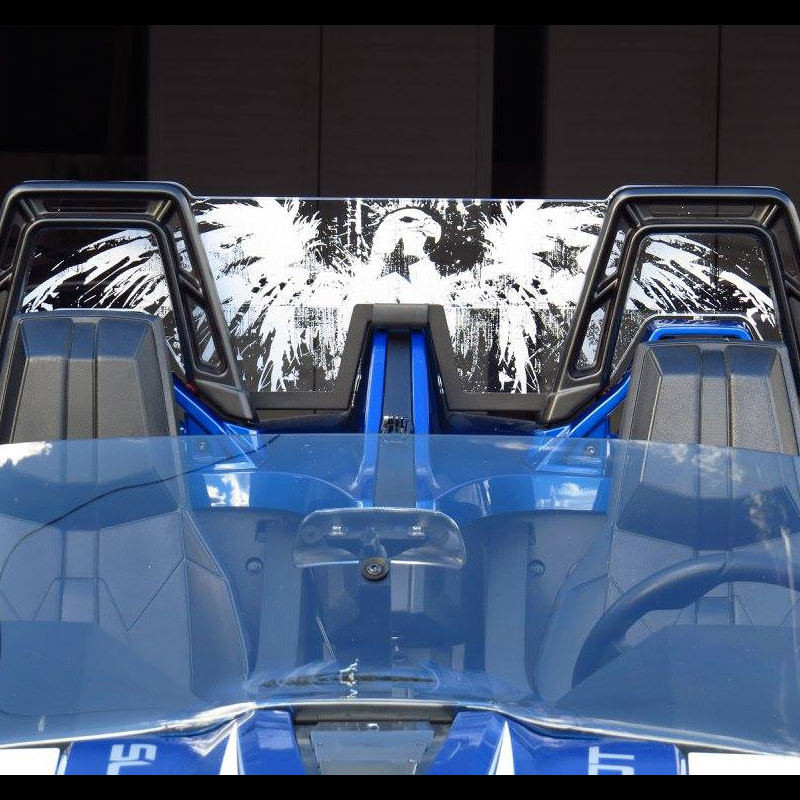 We do recommend a taller windshield to experience the most amount of turbulence reduction but this product will produce results with a variety of shield sizes. The intricate bracket system was created to allow for a simplistic yet sturdy installation, unlike others on the market which may rattle or vibrate while driving. The bracket system is powder coated to match the beautiful black finish of the bars on which it mounts. The unit is an incredibly 3/8” thick, 2-3 times thicker than the windshields that are currently being sold. 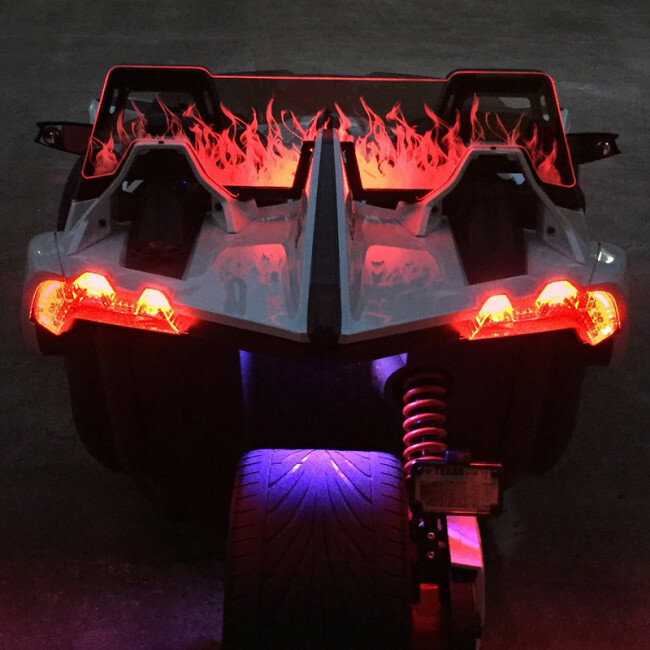 The ambient lighting system is pre-installed and enclosed inside a custom designed bracket made of stainless steel and also powder coated to perfection. The lighting system is waterproof and we guarantee it’s functionality for the lifetime of the product. 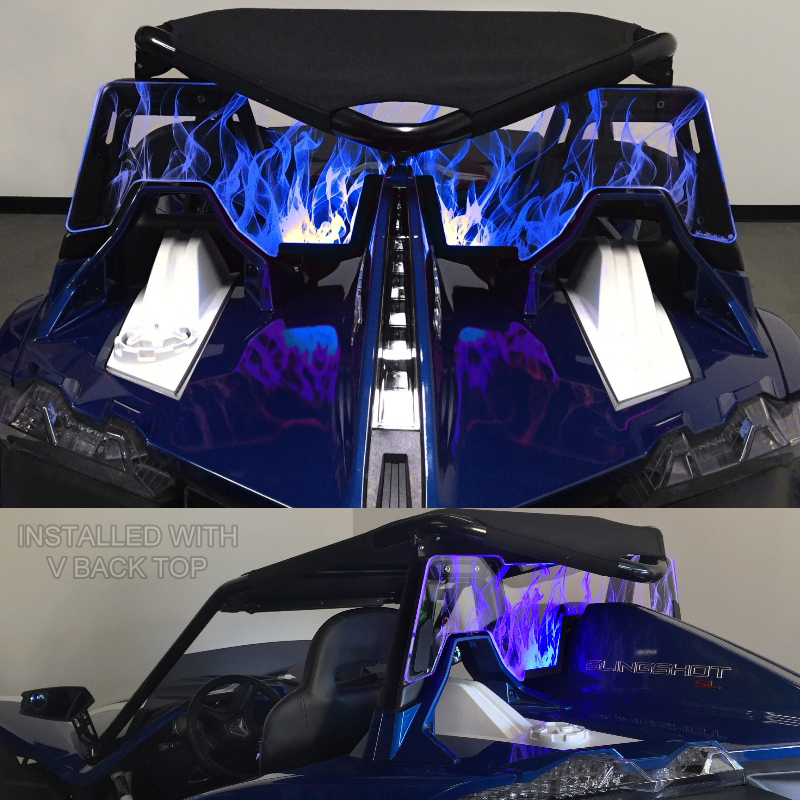 In short, we offer the best quality available that Slingshot owners expect. Which accessories do I need to make the lighting work ? None, this product comes with instructions and the wire tap clamp needed to wire directly into your running lights or brake lights. Accessories are simply add-on features. Extreme Lighting Kit: (Under Color Selection) The extreme light kit comes with a remote control which will give you the ability to set the product on any given color. It also has an on/off switch built in. The module features several different "light show" options as well including fading, blinking, etc through multiple colors. This option requires a minimum of 12 volts for power, so it can be hardwired or used in combination with the 12 volt plug. 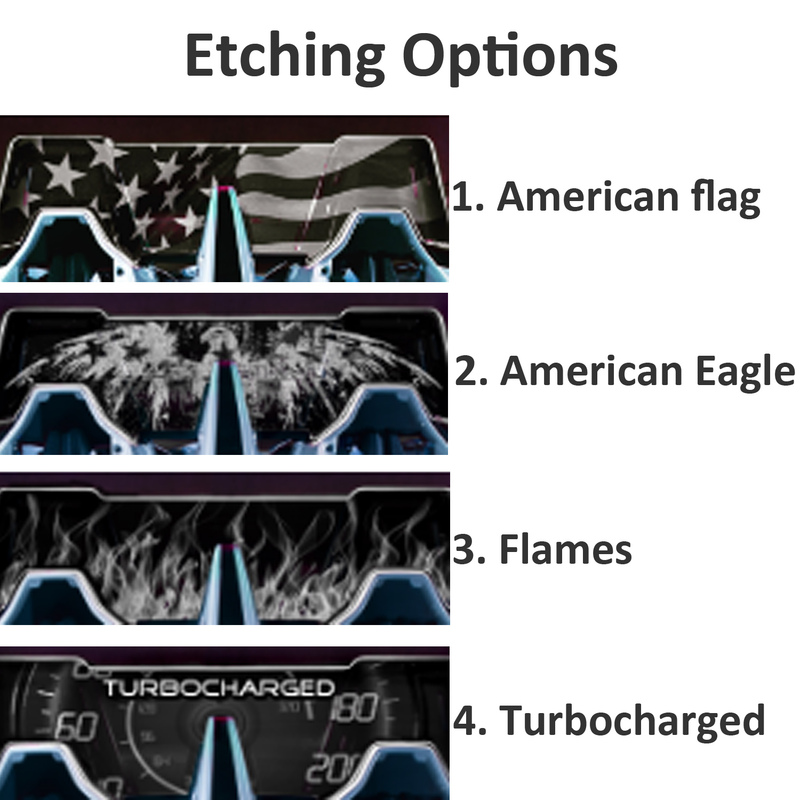 I don’t see a spot to add my custom text or graphics I want, why not? If you want personalized text or graphics you will need to order direct from Windrestrictor.